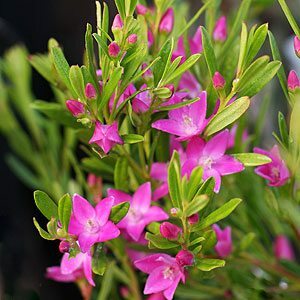 One of the prettiest of all of the Croweas is Crowea saligna, lovely star shaped magenta pink flowers and attractive green willowy foliage make this a stunning plant in the garden. Flowering from late spring to summer through to autumn it adds a welcome splash of colour to the garden. The foliage has a slight aniseed fragrance. Being a very low maintenance plant once established and with low water requirements, this is a very popular species both in native gardens and cottage gardens. Growing well in full sun to part shade this is a plant that prefers a cool moist root run, so consider mulching to provide these conditions. We prefer a position in afternoon filtered shade as the flowering seems to be better in these conditions. Prune lightly after flowering to maintain shape if required. A slow release low phosphate native plant fertilizer applied in spring is best. Flowers – Pink or white with some colour variation. Flowers are to around 4 cm across. Foliage – Mid green, aromatic when brushed against. Position – Full sun to part shade in a protected position. Pruning – Lightly tip prune after flowering to maintain a bushy compact habit. Useful as a small shrub in the border, or grown as a low hedge. Used in mass plantings in commercial landscaping projects also useful as a cut flower. Reasonably frost tolerant and reasonably drought tolerant once established. C. saligna ‘Poorinda Ecstacy’ is a large flowered form, pale pink flowers than most. This is a hybrid between C. saligna and C. exalta.